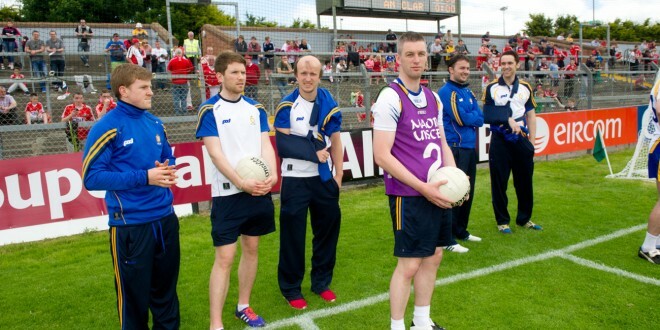 Some of Clare's walking wounded before their game against Cork at Pairc Ui Rinn. From left; Podge Collins, Cathal Mc Inerney. Martin O Leary, Enda Coughlan, David Tubridy and Shane Brennan. Photograph by John Kelly. THERE is no masking the reality that Clare were easily put away by Cork in Sunday’s Munster semi-final in Pairc Uí Rínn. However what will frustrate Clare is the fact that they spurned at least three reasonably clear cut goal chances. Gary Brennan, Keelan Sexton and Dean Ryan all had opportunities to net badly needed goals which, at worst, would have helped Clare to keep it competitive. At this level they found that creating those chances is hard enough and they must be taken to have any chance of making a game of it. Instead Cork romped to a 13 point win and a place in the Munster final while Clare won’t have another game for a month, when they enter the All-Ireland qualifiers. Cork led by six points, 0-10 to 0-4 at half time. Ironically Clare could have goaled after just 14 seconds when Gary Brennan won the throw in and playing a one-two with Jamie Malone, the Clondegad man tore through the Cork defence but his shot on goal dragged left and wide. Cork responded with the first of two points from play from centre back Brian O’Driscoll, while as the game developed and Cork’s first half dominance grew, Colm O’Neill and Donnacha O’Connor added three points apiece, from play and frees. Full forward Brian Hurley and centre forward Mark Collins added a point from play apiece for the home county. The teams were tied 0-2 each after 10 minutes and at that stage Clare were competitive. Dean Ryan, attacking from wing back, kicked Clare’s first point while Pat Burke added the second, making the best of an under hit Gary Brennan free. Brennan added a point from play eleven minutes before half time while his midfield partner, Cathal O’Connor, kicked Clare’s last first half point, seven minutes from half time. Tactically Clare withdrew 13 outfield players, behind the ball, regularly in that opening half. However the inside line of O’Connor, O’Neill and to a less extent Hurley, still managed to find space when hit with decent ball at the right time. Clare opted to go short with virtually every kick out in the opening half and while they lost just one, going short led to difficulties working the ball out and removed the Clare midfielders from contesting even the odd kick out. In that opening half none of the Clare forwards looked consistently dangerous although they would point to the paucity of quality ball they received. Making his championship debut, Keelan Sexton did well on the ball winning front in that half and was fouled four times in that period. Early in the second half however Sexton held his head in his hands, having missed a great goal chance. Cork responded with five unanswered points and led 0-15 to 0-5, 14 minutes into the second period. The game was over even at that point. Jamie Malone then set up Dean Ryan for a goal opportunity but the Éire óg man blasted it wide. After Gary Brennan and Paul Kerrigan had traded points, Cathal O’Connor eventually netted for Clare, having picked up Eoin Cleary’s lay off. That goal put some respectability on the scoreline but Cork, who played a conventional six man forward line, kept chipping away. Twelve minutes from time Donnocha O’Connor buried a penalty, awarded after a foot block. Jamie Malone and substitute Davy O’Halloran kicked Clare’s final points. While this was a very disappointing Clare display, it must be again noted that they were without a number of key forwards, including Podge Collins, Shane McGrath, David Tubridy, Shane Brennan, Enda Coughlan, Cathal McInerney and Martin O’Leary. Clare simply do not have the strength in depth to deal with the absence of these players. The players that lined out did their best but Cork were a step ahead and Clare had were not quick enough on or off the ball. Their decision making was slow and the gap between division 1 and division 3 was clear. Clare: Joe Hayes (Lissycasey); Ciarán Russell (Éire óg), Kevin Hartnett (Meelick), Dean Ryan (Éire óg); Shane Hickey (Kilmurry Ibrickane), Gordon Kelly (Miltown), Martin McMahon (Kilmurry Ibrickane); Gary Brennan (Clondegad-captain), Cathal O’Connor (Coolmeen); Seán Collins (Cratloe), Jamie Malone (Corofin), Keelan Sexton (Kilmurry Ibrickane); Eoin Cleary (Miltown), Pat Burke (Kilmacud Crokes), Rory Donnelly (Cooraclare). Scorers: Cathal O’Connor (1-2, 0-1 ’45), Gary Brennan (0-2,0-1f), Dean Ryan, Pat Burke, Jamie Malone, Davy O’Halloran (0-1 each). Cork: Ken O’Halloran; Conor Dorman, Michael Shields (captain), James Loughrey; Stephen Cronin, Brian O’Driscoll, Barry O’Driscoll; Alan O’Connor, Kevin O’Driscoll; Colm O’Driscoll, Mark Collins, Paul Kerrigan; Colm O’Neill, Brian Hurley, Donncha O’Connor. Subs: Paddy Kelly for Brian Hurley (49), Ruairi Deane for Alan O’Connor (53), Fintan Goold for Colm O’Driscoll (53), Tomas Clancy for Conor Dorman (55), John Hayes for Donnacha O’Connor (57), Peter Kelleher for Colm O’Neill (68). Scorers: Donnacha O’Connor (1-5, 1-0 pen, 0-3f), Colm O’Neill (0-5, 0-4f), Brian O’Driscoll, Paul Kerrigan, John Hayes, Mark Collins (0-2 each), Brian Hurley, Fintan Goold (0-1 each).